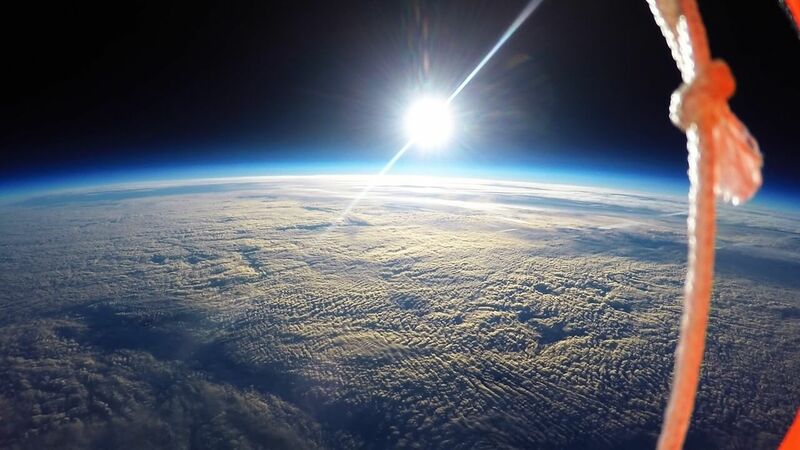 Physics students from the University of Leicester have captured breathtaking images of the Earth’s stratosphere using a high altitude weather balloon. The unmanned balloon and sensor payload reached an altitude of 23.6km, putting it at 1.7 times the altitude ceiling of a 747 airliner. In conditions close to a vacuum with ambient temperatures around -56oC the students’ payload filmed the cloud tops and the curvature of the Earth. The payload then descended quickly to Earth reaching a maximum speed of over 100mph. The launch took place in December near Tewkesbury, Gloucestershire, and the payload was recovered in Warwickshire. As well as producing photographs and video, this flight tested electronic control systems for future pollution monitoring flights and advanced navigational systems. It also allowed the students, assisted by amateur radio enthusiasts, to test tracking techniques which will be used again on future flights. The flight was conducted by student members of the University of Leicester’s Astronomy and Rocketry society, with Ryan Bradley-Evans as team leader of the project, Oli Thomas operating the tracking equipment, Robert Peck responsible for flight control electronics and Aleisha Hogan responsible for public relations. Several other team members also assisted with the project. The team is planning future launches aiming to test the full sensor and advanced navigation systems which time constraints prevented them from launching on the first flight. With the control electronics proven they consider their chances of success to be high.